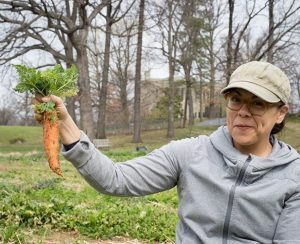 Three Part Harmony Farm is a small-scale agroecological farm, located on a 2-acre parcel in northeast Washington, DC. We grow mostly vegetables as well as herbs, cut-flowers and we have a greenhouse nursery operation that supplies local community and school gardens as well as two locally owned hardware stores. 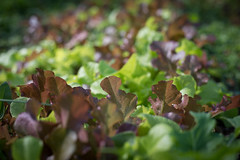 We are using sustainable practices, without chemical pesticides or herbicides. 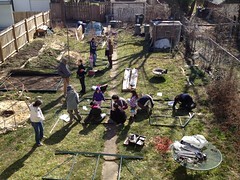 Our three person crew works six days a week to grow vegetables for our community supported agriculture program, a locally based economic model of agriculture and food distribution. It’s a relationship between the community and the farmers. Members pay in advance to pick up a share of the harvest throughout the growing season. 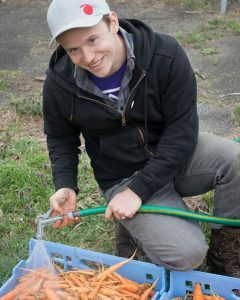 Selling our produce before the season allows us to focus on the actual farm work. You gain the peace of mind that comes from knowing how and where your food is grown. Our mantra defines our core principles: Food as Medicine. Food as Culture. Food for our Future. 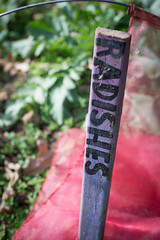 Gail Taylor is the owner/ operator of Three Part Harmony Farm. A long-time resident of the District, Taylor has worked as an organizer and social justice activist focusing on Latin America solidarity (internationally) and affordable housing issues (locally.) She has been farming organically since 2005. Three Part Harmony Farm is a project that was born out of a community-led visioning process that began in 2011. 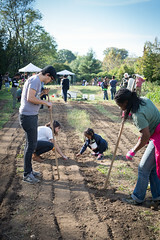 The desire to establish a production focused vegetable farm in DC to grow food for family, friends and the surrounding community combined with Taylor’s background in activism and policy advocacy led to a three-year campaign, “I Want DC to Grow.” This resulted in the passage of the DC Food Security Act of 2014, also known as DCs Farm Bill which sets the stage for 3PH and others to grow commercially in the district. 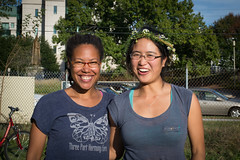 Taylor speaks regularly on food and farming issues and has been featured in The Washington Post in 2014 and 2015 for her role as a leader in the urban ag movement. In 2015, she was featured as one of Fifty+ under 50: Innovative leaders transforming metro DC’s food system. She is a member of the Seed Keeper’s Collective, Ecohermanas, and co-founder of Community Farming Alliance. We donate produce to soup kitchens and food pantries that redistribute food to people in need. We also work on campaigns to create more equity in the food system. We’re committed to help grow new farms and farmers in DC, and to support Black and People of Color owned farms throughout the US. We collaborate with other like-minded enterprises to see our city thrive socially and economically. Three Part Harmony Farm is part of the Future Harvest/ CASA Beginner Farmer Training Program, a 12-month immersive training experience that combines a comprehensive classroom curriculum with hands-on learning at some of the region’s leading sustainable farms. 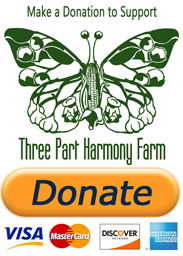 Read about the Three Part Harmony Farm butterfly logo, symbolizing the return of young Black farmers to the land, and our farm community as a resilient migratory being. Click here for videos and photos from the farm. That empty patch of grass? That could be the District’s next farm. 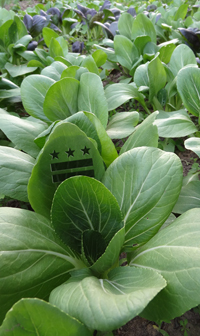 Would a DC “food czar” help urban farmers?